NIC-9704HF-4SFP Server Adapter is Cablexa's fourth generation of PCIe GbE adapter. This adapter showcases the industrys first fully integrated quad-port PCIe Gen2 GbE controller, providing a smaller footprint and lower power dissipation. 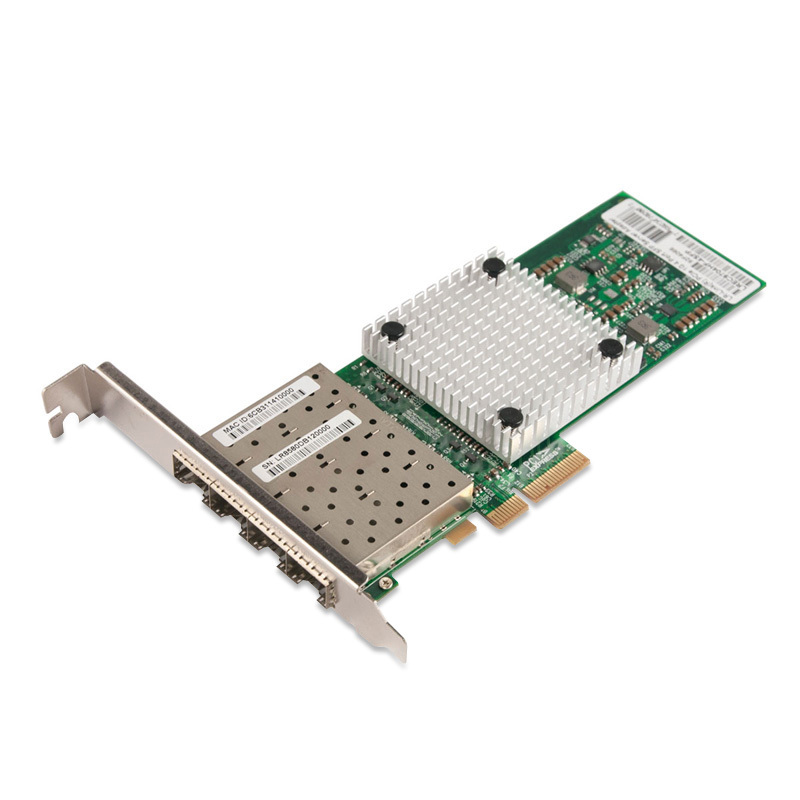 In addition, the NIC-9704HF-4SFP Server Adapter offers advanced features, including support for multi-core processors and server virtualization, as well as a scalable PCI Express Gen2.0 interface. Cablexa's first eco-friendly halogen-free board combines low-power and cost for the best price/performance ratio in a quad-port solution available today. Working to create a more environmentally sustainable future,LR-LINK is pleased to introduce its first halogen-free Ethernet Server Adapter. The transition to halogen-free products is not government mandated, but driven by LR-LINKs goal to eliminate the use of environmentally sensitive materials. The move to halogen-free products marks another step in our continual march toward minimizing the environmental footprint of Intels products, processes, and technologies. This quad-port adapter provides high-performing, multi-port Gigabit connectivity in a multi-core platform as well as in a virtualized environment. In a multi-core platform, the adapter supports technologies such as MSI-X, and Low Latency Interrupts that help accelerate data across the platform, improving application response times. The I/O technologies on a multi-core platform make use of the multiple queues and multiple interrupt vectors available on the network controller. These queues and interrupt vectors help in load balancing the data and interrupts amongst themselves in order to lower the load on the processors and improve overall system performance. For example, depending upon the latency sensitivity of the data, the low latency interrupts feature can bypass the time interval for specific TCP ports or for flagged packets to give certain types of data streams the least amount of latency to the application. Intel I/O Acceleration Technology (Intel I/OAT) is a suite of features that improves data acceleration across the platform, from networking devices to the chipset and processors, which helps to improve system performance and application response times. The different features include MSI-X, Low-Latency Interrupts, Receive Side Scaling (RSS), and others. MSI-X helps in load-balancing I/O interrupts across multiple processor cores, and Low Latency Interrupts can provide certain data streams a non-modulated path directly to the application. RSS directs the interrupts to a specific processor core based on the applications address. The NIC-9704HF-4SFP server adapters with native iSCSI initiators built into Microsoft Windows, Linux, and VMware ESX platforms provide a simple, dependable, cost-effective way to connect to LANs and iSCSI SANs. These native initiators are broadly tested using multiple generations of operating systems, storage systems, and OS tools to help ensure reliability and ease of use. Standardizing on Intel Ethernet server adapters for iSCSI allows administrators to use a single initiator, TCP/IP stack, and set of management tools and IT policies. In addition, the NIC-9704HF-4SFP server adapter includes a number of hardware features designed to accelerate iSCSI traffic and enhance data processing. For example, TCP segmentation offload, Receive side coalescing (RSC), and checksum offload capabilities help reduce processor utilization, increase throughput, and deliver exceptional iSCSI performance. The adapters are designed to flexibly scale workloads across multi-core processor Cbased systems. Finally, using native OS initiators, an NIC-9704HF-4SFP Server Adapter enables support for the CRC-32 digest instruction set included in the Intel Xeon processor 5500 series, which improves transmission reliablity and thus delivers an enterprise class iSCSI solution for the IT customer. The server adapter includes a number of advanced features that enable it to provide industry-leading quad-port 1GbE performance and reliability. PCIe v2.0(5GT/s) support enables customers to take full advantage of the 1GbE by providing a maximum of 2.0 Gbps bidirectional throughput per port on a single quad-port card. For todays demanding virtualized data center environments, the NIC-9704HF-4SFP Server Adapter delivers ultimate flexibility and scalability.